Everyone I know who has lived in Colombia and the United States says the same thing: I lose weight in Colombia and I gain weight in the U.S. It doesn’t seem to matter what they eat. One of my Colombian friends visited her family in Miami for two weeks and ate the same exact food she eats in Colombia, the same portions and all. She still gained five pounds. So why do people lose weight, myself included, when they come to Colombia? Maybe it is the high Andean mountains. Most Colombians live in the western half of the country, including the three largest cities with elevations way above sea level: Bogotá (8,661 ft); Medellín (4,905); and Cali (3,280 ft). However, I don’t think the altitude is the primary factor. The food is simply less processed and more natural than in the United States. Virtually every restaurant, and many street vendors, serve all-natural juice, that is freshly squeezed or blended. Fruits and vegetables are common, as are meats and soups. The portions are also a bit smaller than in the U.S.
Colombian food is tasty, yet quite bland. I’ve never been offered any spicy food since moving here in August. Maybe I’m part Colombian, because most Colombians don’t like hot sauce or hot peppers. I’ve actually had fewer upset stomachs than I normally had when living in the United States. I do have an overly sensitive stomach, which is why I always have a bottle of Pepto-Bismol, but in Colombia, I haven’t needed it. The only thing exotic about the food may be the tropical fruits and vegetables that aren’t as common in the U.S. Otherwise, many of the dishes are quite the same as in America. It may be difficult, however, if you are a vegetarian since chicken, meat, or pork is served with every lunch or dinner plate. Arepas and empanadas are popular across the country, but each region has its own specialities. For example, potatoes are very common in Bogotá, while beans are more common in Medellín, and fish is more common along the Caribbean coast. The great thing about eating in Colombia is the price. I eat lunch at a small diner-type restaurant almost every day. I always get a bowl of soup, the main dish, and a glass of all-natural juice. It is all fresh and called menú del día or comida corriente (daily set lunch). It costs me 3,500 pesos (about $2). Besides the set price, there is usually a set time as well. I can always count on it being ready by noon. Many restaurants are like this. And my food is served as quickly as any fast food restaurant in the U.S. So for me, it’s a great deal: fast, fresh, and cheap. Below is a typical meal that I enjoy called bistek a caballo, a fried egg served on top of a beef steak. This dish also includes arroz (rice), papas (potatoes), yuca (yucca or cassava root), sopa cebada (barley soup), and jugo guayaba natural (natural guava juice). agua de panela (hot sugarcane water) – it is served hot, like coffee. It will give you some energy since it is nothing more than unrefined sugar and water. I usually have a small cup of it when I teach one of my English students in the afternoon. It is an alternative, or complement, to coffee or tea. aguardiente – literally means “fire water.” It is a clear, cane-based spirit that can warm you when living in the Andean mountains. In México, they drink tequila. In Colombia, they drink aguardiente. It usually has about 30% alcohol content. You can buy it in the supermarket, where it comes in bottles or cartons. It tastes smoother from the cartons for some reason. 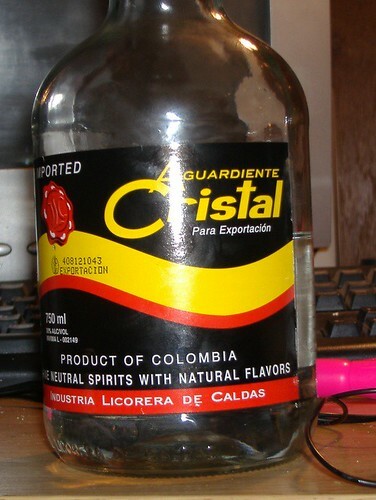 The three most popular brands in Bogotá are Antioqueño, Cristal, and Nectar. This is also my preference order. One further note on alcohol: it is cheaper to buy a bottle of alcohol in a bar than to buy the same amount in individual glasses. This is the norm throughout Latin America. ajiaco bogotano (chicken soup of Bogotá) – a Bogotá specialty that I seem to eat at least three or four times a week. It can be served like a stew. It contains a piece of chicken on the bone, a large chunk or two of corn on the cob, various kinds of potatoes, and lots of herbs. It is almost always served with a side of white rice. arepa – a flat, cornmeal patty, usually about four inches in diameter and a half inch thick. They are baked, fried, or grilled. Its bland taste is often compensated by adding grated cheese before it is cooked. Arepas with chocolate or arequipe are also popular. Sometimes they are filled with a fried egg. Anything can be added to arepas because they serve like tortillas. Though, they have such little nutritional value and don’t have much taste so I try to avoid them altogether. But don’t tell any Colombians I said this. It’d be like telling an American, I don’t like hamburgers or hotdogs. arequipe – is a sweet candy that looks and tastes like caramel. It is made by heating sweetened milk. Arequipe is found in many pastries, such as a roscón or cancha mexicana. Brevas con arequipe are figs filled with arequipe, and are popular in Cali. bandeja paisa (paisa tray) – is the traditional food in Medellín and the Antioquia region. It is served on a very big plate, or tray, and is one of my favorite Colombian meals. It is not exactly the most healthy food, but it tastes great. Bandeja paisa is not only a lot of food, it is a large variety, too. It consists of at least three or four different types of meat (chicken, pork, sausages, chorizos, etc.) served with rice, beans (often in a separate bowl), an arepa, plantains, a fried egg, avocado, and a small salad. café (coffee) – this is what foreigners often think about when Colombia is mentioned. Coffee is the country’s most popular export. For this very reason, the best Colombian coffee is often shipped outside the country, which is why coffee served in Colombia is not as good as one may think. However, it is still quite good and omnipresent. A tinto or trago (a small cup of coffee) is served at any time of day, usually with sugar. Colombian coffee is mild. The most popular coffee companies are Juan Valdez and Oma. Café perico is coffee with milk. Café con leche is a cup of milk with coffee added. cerveza (beer) – the local beer is very good, including the popular Aguila, Club Colombia, and Costeña. American beer is rarely served and hard to find in liquor stores. Popular foreign beers are Corona, Heineken, and Peroni. chicha – an alcoholic drink made with fermented corn, yuca, pineapple, etc. You can’t buy it in a supermarket, and therefore is made by the locals in the know. cuchuco con espinazo – a native stew made with pork, wheat, beans, peas, potatoes, and various seasonings. It is popular in Boyacá. empanada (meat-stuffed pastry) – small meat (sometimes chicken or cheese) pies that look like small calzones. Like arepas, they can be seen in most small restaurant or bakery windows as you walk by on the sidewalk. feijoa (pineapple guava) – a green fruit the size of an egg. Its inside is made of a clear, jelly-like pulp that is sweet and high in vitamin C.
granadilla – is a fruit native to the Andean mountains, as it lives in altitudes from 1,700 to 2,600 meters above sea level. It also requires a lot of rain. It is a round, light-orange colored fruit. When you break it open, it is filled with tons of hard, black seeds. Around these seeds is a gelatin-like pulp that you eat and has a sweet yet acidic taste. You can eat the seeds, too. guarapo – is a sugarcane, or sometimes corn-based alcoholic drink. It probably isn’t that healthy because it contains mostly raw sugarcane. It should only be served fresh, as it doesn’t keep long. jugo natural (natural juice) – unlike most American juice containers that say “100% natural,” the juice here is the real thing. It is mixed with water, or milk (making it a sorbet), depending on one’s preference. Many street vendors have machines for squeezing the various types of fruits and vegetables, which include: curuba (banana passion fruit); guanábana (soursop); guayaba (guava); lulo (naranjilla); mango; maracuyá (passion fruit); mora (blackberry); níspero (loquat); papaya; piña (pineapple); tomate de árbol (tree tomato). mazamorra – is a dessert popular in the Antioquia region. Corn or maize is boiled and sugar and milk is often added. It looks like rice pudding. In Boyacá, however, mazamorra is a meat and vegetable soup. mute – a thick soup or stew that is served from a large clay pot with a wooden soup spoon. It contains beef and pork, as well as potatoes, beans, egg plant, onions, peas squash, and avocado. Many seasonings are added. sancocho – a popular main course, usually a large bowl of stew containing chopped fish or some kind of meat, and vegetables such as yucas, yams, corn, and potatoes. tamale – a meat pie made with corn dough and wrapped in plantain leaves. Inside is chopped pork or chicken mixed with potatoes, peas, onions, eggs, olives, garlic and other herbs. The whole thing is steamed and you can eat everything but the banana leaves. uchuva, uvilla (cape gooseberries) – a small orange fruit about the size of a cherry. You can buy them in the supermarket or from a street vendor. They’re very sweet, and can be used to make jam or pies. Thanks for bringing back those yummy bogota food memories. I am going to Bogota for the first time later this year. The food looks great! Any concerns with water quality or anything I should avoid Brett? Hi Steve, great to hear that you're coming to Colombia! The water in Bogota is reportedly among the best in all Latin American cities. You can drink from the tap without any worries... it comes straight from the mountains. As for food, I would try everything and see what you like. Just use the same precautions when traveling in any city and you'll have a great time here. Good luck! Hey Brett! I'm from Bogota and i've read all your posts! i see you are having loads of fun and i encourage u to keep exploring our contry! Daniel and Selllfmade, thank you for the encouragement! And the granadilla... I had never separated the seeds!! Just swallow them down without chew them. Some people does bite them, because they say it's good for digestion, but I don't like the taste of it. Yeah Brett, just like dianacats says, you are supposed to eat the seeds in the granadilla as well. It is actually one of my favorite fruits. By the way, please try Postre de Natas, you definitely won't regret it. Thanks for letting me know about the seeds; I just changed this blog ... it's been so long since I had granadilla that I forgot. I just read about Postre de Natas. It reminds me of rice pudding back in the U.S. I'll have to give it a try. Thank you. My GF is Colombian most meals Dinner especially consists of meat rice and Plantains sometimes with Yucca and beans. One thing I notice about the Colombian Diet is it really lacks Green leafy vegetables like spinach Kale Broccoli (rabe) or collared greens. As a tourist in Colombia (Medellin), I found there to be a lot of fried food, potatoes, white rice, cheese, sausage, sugary juices, arequipe and fried plantains. While I don't regret it, I gained a few pounds while I was there! Hola! I came across your post while looking at Colombian diets. Yours is the most honest blog about my home country and totally concise! I love it. Yes, we drop weight there! The exercise one gets there and the less process foods is a huge thing. There's more balanced lifestyle that helps the body. I am working on getting back to the colombian diet basics to drop 20#! Wish me luck! Thanks again for this sublime post! !